If you have multiple students using Writing With Ease, this additional set of Level 2 Student Pages will save you loads of time and work! 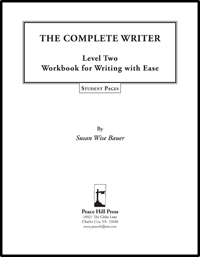 The Writing with Ease Level 2 Workbook already contains one set of Student Pages. If you need additional Student Pages for use in your family, you’re free to make copies from the Workbook. Many parents find it easier to skip the photocopier and simply purchase this additional copy of Level 4 Student Pages. The text for the narrations are included, however instructions for the parent or teacher are not included in these Student Pages. Those instructions can only be found in the Workbook. If I purchase the PDF, how many pages will it be? The pdf is 180 pages.